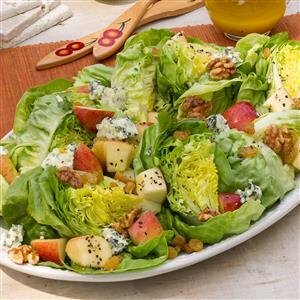 In a salad bowl, combine the lettuce and apples. In a small bowl, whisk the oil, vinegar, honey, mayonnaise, mustard seed, mustard, salt and pepper. Drizzle over salad and toss to coat. Sprinkle with cheese, walnuts and raisins. Serve immediately. Makes 9 servings.